Well, it’s been a little while! I’ve been busy, busy, busy. 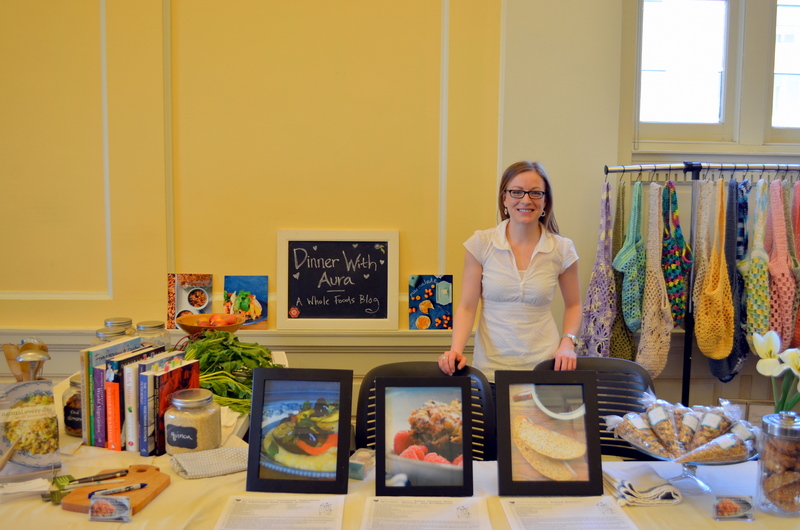 This past weekend I had a Dinner With Aura booth at the Grand Rapids Public Library’s Green Market Expo. It was so much fun! I sold some granola and biscotti, raffled off Super Natural Everyday, and met so many awesome people who were interested in eating healthier. Several folks mentioned that they were simply trying to reduce the amount of meat they ate, replacing a few meals a week with vegetarian options. That got me so excited. I truly believe that small changes add up. It can be really intimidating to be expected to change everything about your eating habits. Eating is such a personal and habitual experience so I believe that tackling one change at a time is the key to long-lasting change. I met a lovely woman who wanted to start by eating vegan three days a week. I’m so excited to hear how that goes for her and excited to see what new foods she will discover in the process. I’ve also been busy moving my honey into my house. Having lived alone for three and a half years, this has been a big change! We are in the process of merging our things and getting into a routine. I’m excited to see what the future holds for us. This weekend was so busy that I just ate really simple dishes. I was cooking for myself this weekend so things were back to my usual one person meals, quinoa with sauteed kale, zucchini, carrots, etc. I really don’t mind eating like that most of the time but it is fun to have someone to cook for and I tend to make more substantial meals when I’m not on my own. Today, I was so happy that at about 7:00 I finally had time to cook up the recipe for the Food Matters Project. I was even more happy that it is finally spring and we have daylight at 7:00! This dish was so easy to put together and so tasty. All I can say is thank you for the awesome pick, Jess! Once again, I had a hard time imagining what this salad would end up looking and tasting like. The result was such a pleasant surprise. It had so many flavors I love all in one bowl. I modified the dish somewhat, adding quinoa, radishes, and peanut to the mix. 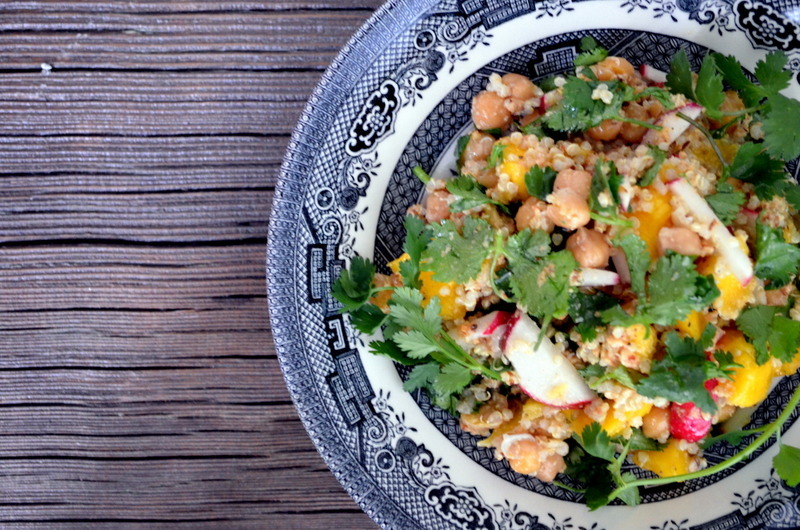 The chickpeas and quinoa provide protein and the nuts provide healthy fats. This salad is a great main dish meal. If you are looking for something a little different and very, very easy, try this! You won’t be disappointed. If you want the original recipe, head over to Jess’s site. And to see the variations everyone came up with, head over to the FMP website. To make chutney: In a small, dry skillet, combine cumin seeds, chili, cashews, and peanuts. Heat over medium heat, shaking pan frequently for 3 to 5 minutes or until everything colors slightly and becomes fragrant. Transfer to blender or food processor. Add garlic and a sprinkling of salt and pepper. Process, stopping machine to scrape down sides if necessary, until finely ground but not as smooth as peanut butter. 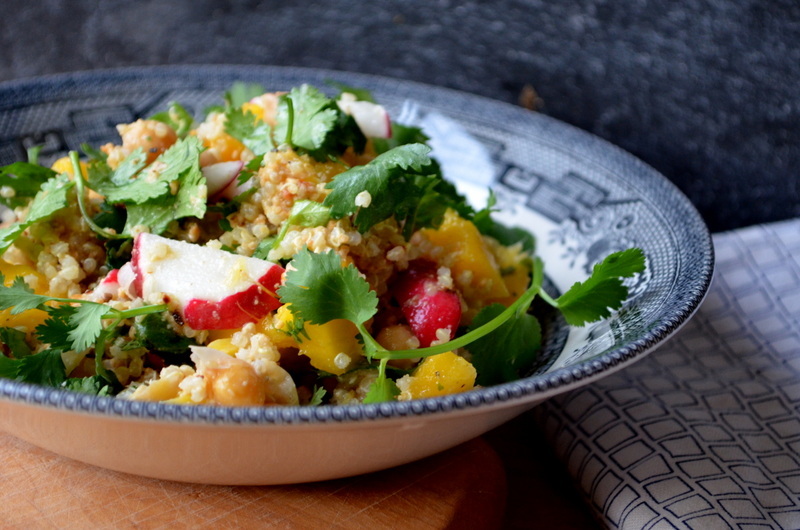 To assemble salad: In a salad bowl, toss chickpeas, quinoa, and fruit with chutney. Add lime juice and a little oil if needed to help bring everything together. Stir in cilantro and radishes. Taste. Adjust seasoning. Serve immediately or cover and refrigerate for up to 1 day. Enjoy!!! Cashew chutney sounds different and delicious! Salad looks great ,Aura! Good one! Thanks, Vini! I had no idea what to expect and I’m really glad I tried it! It was really, really easy and very tasty indeed. Now, that’s a lot of excitement going on! And what a lovely dish. Thanks, Michelle! Just reading about your misadventures in Florence! Oh my goodness! I will never go there after your harrowing experiences! aura, what a cool idea and experience to have a booth at your expo!!! if i lived there, i would so have gone to meet you. your salad looks so pretty and what a great use for radishes! i have some radishes sitting around and i really need to use them up, ASAP! thanks for the inspiration! Love the idea of a booth, Aura! That must have been so much fun. I tend to make really simple one-dish meals when I’m busy too, and this was a good one to add to the rotation. Great call on adding quinoa to make more of a complete meal! That’s fantastic that you were able to have a booth and get people talking about eating healthier and with less meat. You’re right- eating is such a personal thing, and it’s hard to change, so small steps do matter! I’m excited to hear if you’ll get more responses about how you impacted people! Also, congrats on moving in together- I hope it all goes well. Sometimes it’s hard to merge things together/have a new routine. 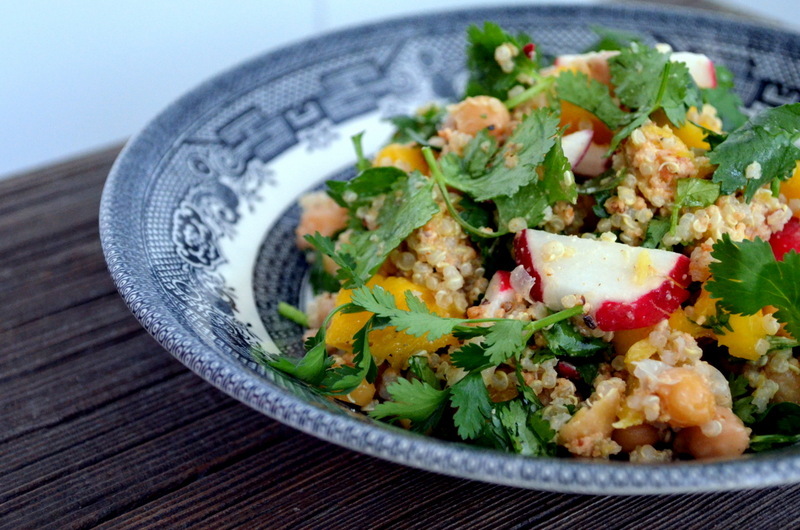 And lastly, love that you added the radishes and quinoa into the salad- delicious! I did the grain too, just to make it a bit more substantial!